Middle aged, prim woman, in her sophisticated pumps, probably coming straight from tea with her bridge partners, walks into the pawn shop. I write this because I am puzzling and puzzling til my puzzler is sore as to why someone would have cleaned out our entire DVD cabinet while we were at the in-laws over Thanksgiving. (And in case you’re wondering, our Copy of The Grinch was safely on video still.) Because for the life of me, I cannot fathom what exactly the resale value on the black market would be for, say, Showboat, or Anne of Green Gables. or Gideon, Tuba Warrior. Not to mention the random copies of our community theater performances. I won’t even watch myself playing Mother Superior in Sound of Music. Now someone else wants to? The killer for me, of course, is the entire six hours of Pride and Prejudice. Watched at least three or four times a year. It has become a bonding experience between me and Middle Child. I am an avowed Jane Austen freak. I even took an entire class on her in college. 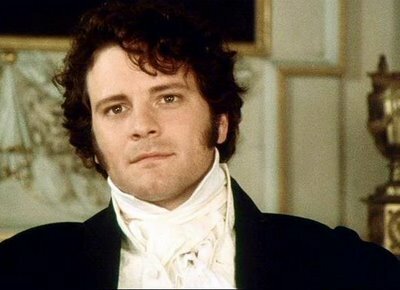 And as anyone who really knows me knows, if I were not very happily married, I would be stalking Colin Firth. So altogether, not a happy loss. In any case,the point of this post is not to whine. It is to mention an important reality that many know but others may overlook. Teach your children (and yourself) about safety and social media. –Mentioning your vacation plans, dates, reservations, etc. –Talking about the things you’re seeing. Like, for instance, if we had lost our sense enough to go to Mall of America over Thanksgiving, we should never have mentioned it. Not simply because this is embarrassing to admit, but because anyone who checks our information page knows we do not live in Minneapolis. And even if you don’t do these things, your kids might, in simple normal virtual conversation with their friends. Except, not everyone they are ‘friends’ with is a friend. And you really have to impress on them how one, small innocent piece of information can give away so much. Any other good ideas on what not to post for the world to see? I’d love to hear them. For more information on how people use your information, see the link below. I try to not post anything with exact locations. When I posted the orchestra concert, I didn't name the school and I waited until we were home to post it. If I go somewhere with just the hubby, anyone who knows me will know that one of my tribe is still in the house with the rottweiler and the attack llasa apso. Come to think of it, Our house is never empty. We even stay home for the holidays. I need a life! This is exactly why my husband didn't want me to post anything about our vacation on FB last summer. I said that he was just being paranoid but didn't, just to be cautious. He hates FB, so I don't want him to have any fuel to add to his fire, so I probably won't mention that this happened to you. So sorry that it did though!